The Abalone Fishery is one of Victoria's most valuable commercial fishery. Almost all of the catch is exported to international markets, predominately in Asia. Abalone are caught along the majority of the Victorian coastline and the fishery is primarily based on targeting blacklip abalone (Haliotis rubra). Greenlip abalone are also targeted (Haliotis laevegata). The fishery is quota managed, with a total allowable commercial catch set annually based on the outcomes of a stock assessment process. The Abalone Fishery is one of Victoria's most valuable commercial fisheries. Almost all of the catch is exported to international markets, predominately in Asia. Abalone are caught along the majority of the Victorian coastline and the fishery is primarily based on targeting blacklip abalone (Haliotis rubra). Greenlip abalone are also targeted (Haliotis laevegata). The fishery is quota managed, with a total allowable commercial catch set annually based on the outcomes of a stock assessment process. There has been a considerable investment in abalone research to assist the management of this valuable resource. Research has focused on understanding the nature and dynamics of the resource. A broad spectrum of information is used to model the behaviour of the fishery and the response of the resource to the impact of fishing. The primary management objective in the Victorian Abalone Fishery is to rebuild the abalone resource to ensure sustainability economic productivity. Blacklip abalone(Haliotis rubra)stocks within the contemporary fishing grounds are fully fished. Greenlip abalone (Haliotis laevigata)stocks have limited abundance in the Western and Central Zones. Abalone is a mollusc (shellfish). It lives on rocky reefs from the shore out into the sea to depths of 30 metres. Abalone is collected by divers who use a chisel-like, iron bar to prise it from the rocks. 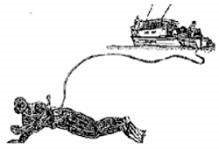 The divers can stay under water for long periods by using hookah gear (they breathe air supplied to them through an air-hose connected to an air compressor on their support vessel), therefore commercial divers prefer using this, rather than SCUBA gear. The Victorian Wild Harvest Abalone Fishery Management Plan specifies the objectives, strategies and actions for managing the fishery for at least five years from the declaration of the plan. The commercial fishery commenced in 1962 and during its relatively short history has been subject to fairly intensive management in the form of legal minimum lengths, zonation of the fishery, limited entry and quotas. There are 71 fishery access licences in the Victorian Abalone Fishery, which is subdivided into three management zones. The licences are distributed across the three management zones, with 14 in the Western Zone, 34 in the central zone and 23 in the Eastern Zone. This means a maximum of 71 divers can operate on any particular day. Some divers harvest abalone on behalf of more than one licence holder and some holders own more than one licence. Licence ownership may be by individuals or businesses and units of quota may be temporarily transferred among licence holders for the duration of a quota year. The quota year commences on 1 April and continues until 31 March of the following year. The key management controls for the Abalone Fishery are outlined in the table below. The Victorian Fisheries Authority (VFA) undertakes a process to set the Total Allowable Commercial Catch (TACC) for abalone each year. Before setting a TACC, the department undertakes a stock assessment which provides information on the status of abalone stocks. This information is considered by the department and industry at TACC Forums in each management zone. At the forums, a TACC is recommended, through a weight of evidence approach, on a sustainable level of catch. Based on the forum recommendations, proposes a draft TACC for each abalone management zone, which is released for a period of public consultation before making a final decision. 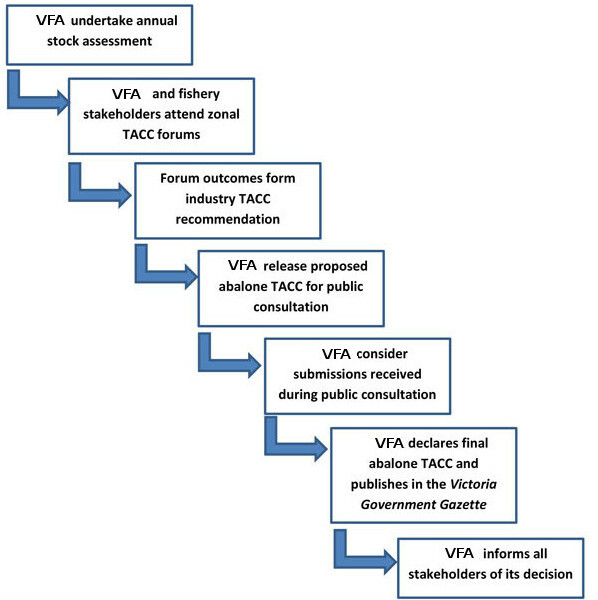 The process for setting the abalone TACC is summarised in the flow chart. Research and development is an important component of abalone fishery management. There has been a considerable investment in abalone research in Victoria and the other south-eastern states. The combined expertise and facilities of these states ensures that the abalone resource is well researched and monitored. Nonetheless, there are biological processes and ecological relationships that are not well understood, owing to the difficulties posed by conducting field experiments in areas subjected to strong wave energy. In addition, monitoring early life history processes such as larval, post-larval and juvenile abalone densities has mostly proved intractable as a consequence of sporadic patterns of spawning and settlement as well as occupancy of cryptic habitat. This invariably leads to the need for assumptions or the use of surrogate measures to conduct stock assessments. Other available research, such as maturity, spawning potential, natural mortality, growth and biomass estimates. Industry TACC Forums are undertaken in each of abalone management zone to consider the information provided by the stock assessment and provide recommendations to the Minister on the TACC and associated management arrangements. The workshops are facilitated by an independent chairperson and are open to attendance by all commercial quota holders, commercial abalone divers, representatives of the recreational fishing sector and other relevant stakeholders. The department presents the annual abalone stock assessment to the forum including fishery modelling that has been undertaken. Industry is also able to provide their views and observations on how the resource is fishing, as well as discuss any research they may have undertaken independently. This information is considered by divers, licence and quota holders, VFA fishery managers and scientists, and other stakeholders in a structured weight of evidence approach to recommend a TACC. Recommend the TACC for abalone during the following fishing season. Increase industry participation in the management of the fishery. On 4 July 2017, Hon. Jaala Pulford MP, Minister for Agriculture, signed an amendment to the Initial Abalone Quota Order to allow an Abalone Fishery Access Licence holder to be in excess of his or her quota allocation by 10 kilograms or less on their last day of fishing in a fishing period. The Initial Abalone Quota Order amendment specifies that this amount must be deducted from the quota allocation applying to that access licence in the following quota period. Enabling commercial abalone licence holders (and their divers) to land up to 10 kilograms above their annual individual quota allocations on their last day of fishing in a fishing period is an action of the current Victorian Wild Harvest Abalone Fishery Management Plan. The establishment of a single representative body for the Victorian Abalone Industry Central Zone.